BENVENUTO AL SOGNO DEL NOSTRO PESCATORE SITUATO A DESTRA FUORI I-210 E GRANDE STRADA DEL LAGO ... LANCI LA TUA BARCA IN GIRO PER L'ANGOLO AL PUNTO DI CALCASIEU. DALLA PROPRIETA ', SOLO UNA BARCA GUIDA A BORDO DEL CANALE CHE PORTA NEL CANALE DELLA NAVE SEI MINUTES VIA DA CATTURA IL TUO LIMITE PER IL MIGLIOR ROSSO, SPECK, FLOUNDER E PESCA NERA DI TAMBURO INTORNO. CON LA NOSTRA DUE CAMERE DA LETTO, PIANO A DUE PIANI APERTO, SARÀ IN GRADO DI GODERE LA TUA AZIENDA E LE VISTA MOZZAFIATO. CAMP OCCUPA 7 CON UN LETTO KING, UN LETTO QUEEN, UN LETTO A CASTELLO PIENO CON UN TWIN IN CIMA. GRIGLIA A GAS SUL SITO. NON DIMENTICARE I TUO KAYAK! PUOI KAYAK A SCENDERE IL CANALE E ATTRAVERSO LE BELLE ZONE MARSHY CON LA RAMPA DI LANCIO FACILE SULLA PROPRIETÀ! CERCHI UNA CARTA DA PESCA? POSSIAMO AIUTARTI CON QUELLO! MESSAGGIO USA PER MAGGIORI DETTAGLI! POZZETTO FUOCO ESTERNO! PORTA ALCUNI LEGNI E I TUOI SMORTI! Really enjoyed our weekend getaway! You feel like you are away from everything, and you are, but you are just minutes from anything you need. Great view and pkenty of comfort. Huge back porch and all the room you need under the house with shade and breeze! We had 2 boats with plenty of room to park. Nice kitchen and huge fridge. Can't wait to get back. Hopefully Mother Nature will be on our side next time! We had a great time. The house was clean, beds were comfortable and beautiful sun sets. We fished with Chase from Fleur de lid charters and he was awesome. We toke the Creole Nature Trail and out favorite part was seeing all the alligators on the drive through trail. Highly recommend this with kids. Go see the people at the creole nature trail visitor center to get all the info. We loved our stay. Thank you. After running into some scheduling issues, (thanks Tori for working with us!) we went down for a fishing weekend. 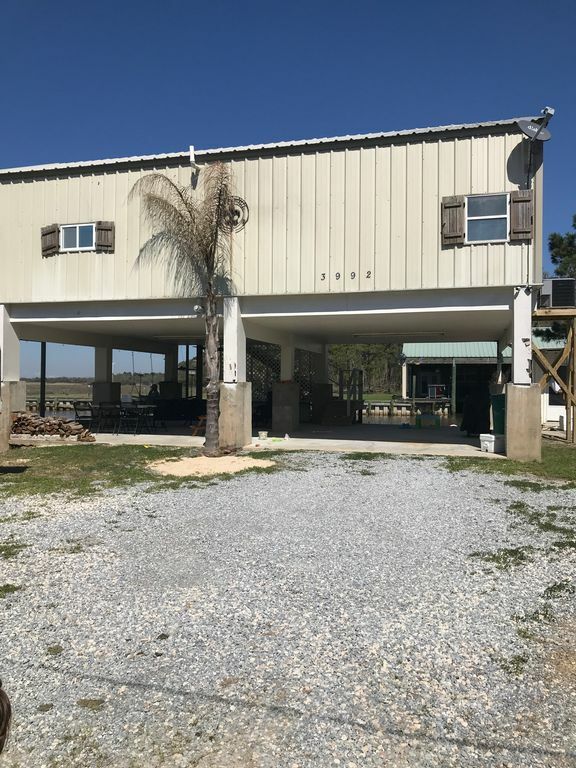 The property is conveniently located less than five minutes away from Calcasieu Point landing. Everything at the camp was great and we will be back soon! Such a warm and inviting place. We had one issue we brought the owners attention. They were unaware of the issue and provided us feedback and solution same day. Such a nice place to see. We didn’t see any neighbors and it was like we had the entire cove to ourselves. Great spot to get away from the hustle and bustle! We had a “girl’s getaway” of childhood friends who had all turned 40 this past year. It was the perfect spot for us busy moms to relax and recharge. Our favorite things were the amazing sunsets and reminiscing by the fire pit at night. We definitely made new memories that we will cherish from our weekend getaway here!!! Thank you for sharing your little piece of paradise with us. This is my favorite review of all time !! This is exactly why we share our camp with awesome guest like y’all! Come back soon! We will be back, we had a wonderful week. Many thanks & God Bless! :) thank you! Merry Christmas!